Duke was built in 1947 in Tacoma, WA by Cummings Boat Company. She is Douglass Fir on steam bent oak frames. Like many trollers of her era, she is powered by a Detroit Diesel 6-71 engine. 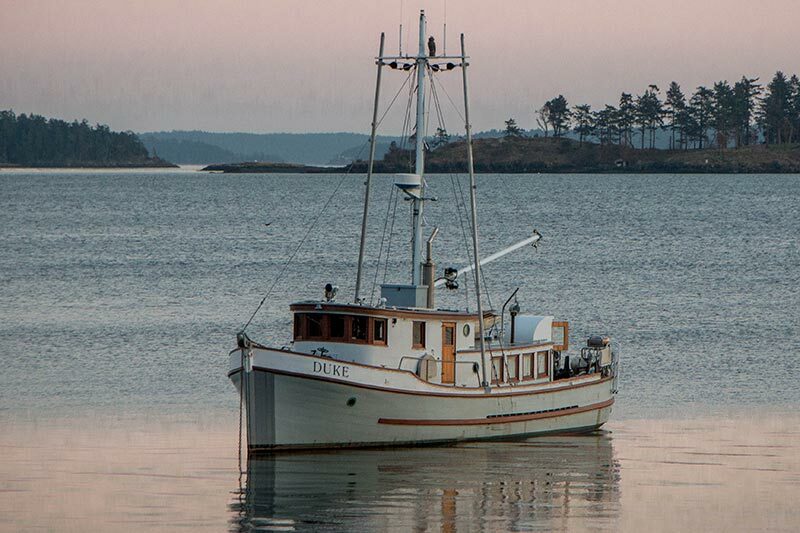 After she was built, she fished out of Sitka, AK and soon after moved to Eureka, CA. On opening day, 1955, her first season as a crabber, she set the record that year: 7,000 lbs! SHe went through 2 owners in Eureka before moving to Port Townsend in the late 1990s, owned by Prentiss and Heidi Bloedel, who converted her to a cruiser. Duke was then owned by Curtis Schloe, who lovingly maintained her. Ryan Downs bought Duke in 2015, and is continuing to care for the ship. The vessel will head back to Alaska next summer to take passengers on weeklong trips out of Petersburg.